Fishing deeper and slower than the competition helped Rapala® pros Gerald Swindle and Brandon Palaniuk to runner-up and 7th-place finishes, respectively, Sunday in a tough Bassmaster Elite tournament on the Sabine River system in Texas. Baits that put bass in the boat included Rapala BX™ Brats, Storm® Arashi® Cover Pops, VMC® Shaky Head Jigs and VMC® Sureset Drop Shot Hooks. While many competitors were fishing extremely shallow, Swindle discovered a deeper pattern when he caught two quality bass on a BX Brat squarebill crankbait in about five to six feet of water during the three-day practice period that preceded the four-day tournament. 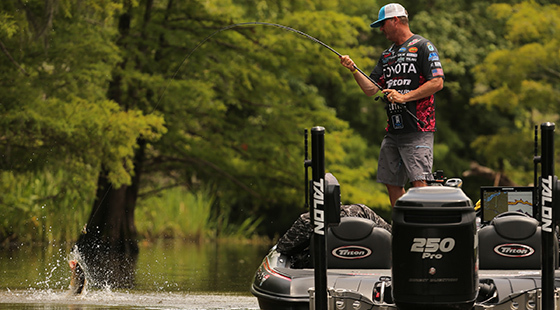 “I caught two key fish in practice and thought maybe they’re off the bank,” Swindle says, explaining his decision to slide out even deeper and fish finesse baits around ditch ledges in seven to nine feet. While that decision didn’t pay off immediately – Swindle was still in 32nd place after the first two days of the four-day tournament, and in 10th place heading into Championship Sunday – it was a difference maker, propelling him to success in conditions most pros agreed was very tough. The Sabine River system challenged anglers with brackish water (a mix of seawater and freshwater), tidal water-level fluctuations, and a population of more small bass than big ones. Additionally, conditions were uncomfortably hot for man and bass alike. Water temps were in the 90s for much of the tournament, before dropping to near 80 degrees for the final day. In a tournament in which a keeper bass needed measure only 12 inches and three-pounders were hard to come by, Swindle’s decision to zig when most everyone else zagged was a difference maker. One of the bass he caught on the drop-shot rig was a 6-pounder, which he stuck and kept buttoned up all the way back to the boat with a 1/0 VMC Sureset Drop Shot Hook. A 4 ½-pounder came on 3/16th oz. VMC Shaky Head Jig in the same area, a ditch running down the middle of a what Swindle describes as a “main chute” feeding into the Square Lake area of the interconnected Sabine River system. A decision Sunday to slow down further and fish on top with an Arashi Cover Pop was another difference maker for Swindle, rewarding him with two 4-pounders. 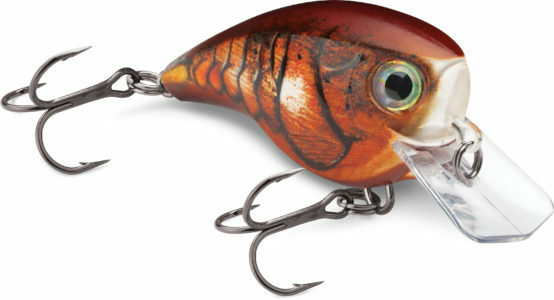 The Cover Pop triggers vicious strikes from bass by emulating prey struggling on the water’s surface. It’s most productive, usually, when fished near shoreline brush, trees, laydowns, undercut banks, reeds, docks, rocks and anywhere else bass hide out. A specially designed cupped face and line-tie combine to create a unique sound that pulls fish out of cover. A flash-feather teaser tail its rear treble adds action and enticement. Palaniuk finished 7th out of 108 total competitors, climbing from 80th place after the first day. He too caught difference-maker bass on BX Brats and Arashi Cover Pops. “I stuck to the same areas and stuck to the same few key baits and cycled through them,” he says. Arashi Cover Pops measure 3-1/8 inches and weigh half an ounce. They’re available in nine color patterns: Hot Blue Shad, Pearl Ayu, Bluegill, Ghost Hitch, Ghost Pearl Shad, Green Gill, Ghost Chartreuse, Black Silver Shad and Pro Blue Chrome. 3D holographic eyes add realism and enhance attraction. BX Brats are built with a balsa-wood core encased within a brawny hard-plastic shell. That construction allows you to bounce ‘em off hard cover and structure without getting beat up a bunch or hung up often. 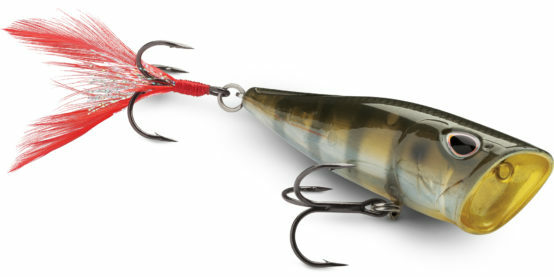 As do all balsa baits made by Rapala, BX Brats float up and back out of cover well, minimizing snags. Your best bet to boat bass with a BX Brat on your home waters this summer is to bang it into shallow cover like rocks, downed trees and dock posts. Cast it as parallel to the shore as you can and ensure it makes bottom contact throughout the majority of your retrieve. Retrieve it directly into and over whatever heavy cover you can find. BX Brats are available in two models. One dives to three feet, the other to six feet. Both measure two inches, weigh 3/8th of an ounce and come armed with two sticky sharp VMC® No. 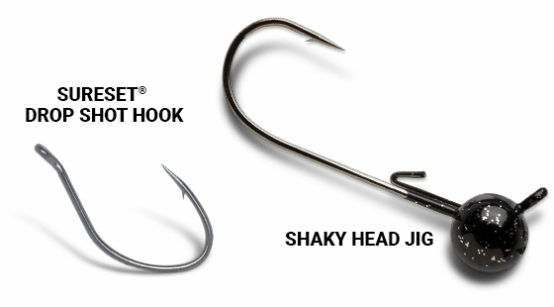 6 Black Nickel Treble round-bend hooks. They are available in 12 color patterns: Blue Ghost, Blaze, Bone Craw, Carbon, Delta, Haymaker, Homer’s Buddy, Mossy, Pearl Gray Shiner, Tamale, Silver and Rock Solid. More often than not, natural color patterns are best in clear to lightly stained water, and brighter patterns are best in stained to muddy water. With those water temps, the tournament should have been called off. Too hard on the fish………..